The town of Wuhan, China has announced that they will not only be aiming to take away the record for tallest tower, but that their two planned towers will actually be able to clean the polluted lake and air that they sit next to. These two towers will sit almost a kilometer high at a full 1,000 meters, easily wresting the record from the world's current tallest tower-- the 830 meter Burj Khalifa Tower. All tall buildings require a lot of power, primarily to run the lifts inside, so it often does not make them very environmentally friendly. However, the UK architects-- the Chetwoods--hired for the job were tasked with not only designing these tall towers, but also making them so as they help the substantial pollution problem in Wuhan. 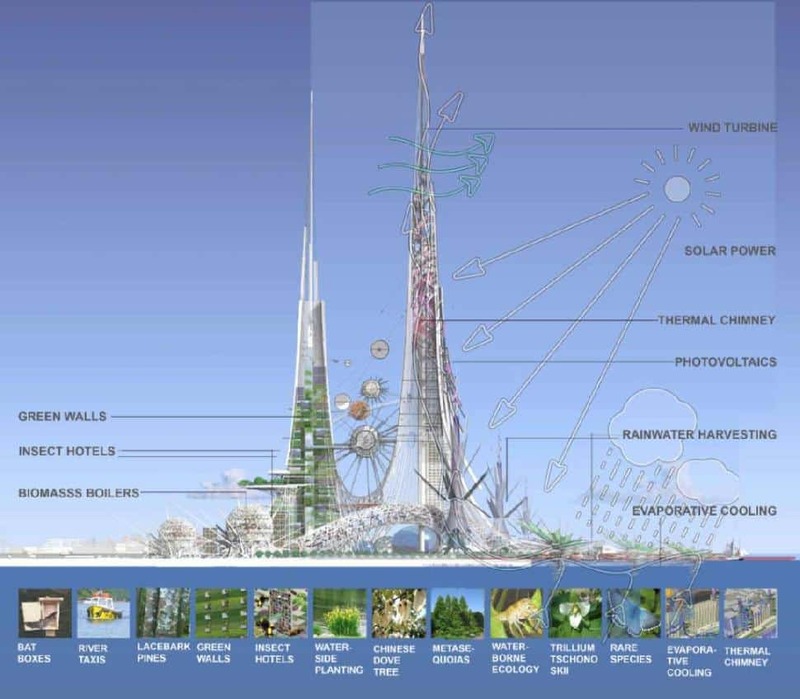 In order to fulfill the tremendous amount of power needed for the building, it will be outfitted with wind turbines, lightweight solar cladding and hydrogen fuel cells that run on the building's waste to see not only the buildings fully powered but a portion of the surrounding community as well. While the building will create little in the way of pollution, it has been designed to go the extra measure and actually decrease some of Wuhan's infamous pollution. The towers will have pollution absorbing coatings to help clean the air, vertical gardens to only further filter pollution and a chimney in the middle of the larger tower that helps pull air from over the lake for better ventilation in the city. Since the buildings are built by a lake that also suffers from pollutants from the city. The buildings will use passive force to bring lake water up into the buildings, through a filter and back out into the lake again. This will help clean out the large number of trash and chemicals found in lake water. All of this is presented in an extremely tight timeline. The towers are set to break ground later this year and be completed in 2017. This timeline compared to the Burj Khalifa Tower that took six years to build and being considerably smaller makes this rather marvelous.